You’ve heard of Haribo Tangfastics, right? What about Tangfast-Chicks!! No I haven’t heard of them, which is surprising as I LOVE haribo and eat more than the average 6 year old at a birthday party most weeks, particularly Tangfastics (also Starmix and Supermix, which I’m pretty sure had to be rebranded as “Supermix” rather than “Kiddies Supermix” as it had been previously purely for people like me). I digress. 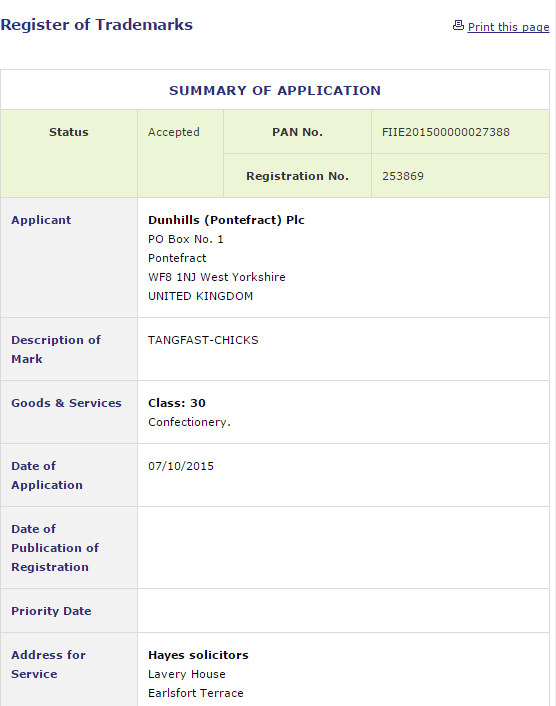 Apparently, Tangfast-chicks are a think (see here) and Haribo have now applied to register ‘Tangfast-chicks’ as a Trade Mark in Ireland. Easter, sorted. NOM. PreviousA new game from the makers of Farmville, The most hipster jeans EVER and Blue Shade – Yesterday’s TM Filings! NextInsurance Small Print – Heeeeeelp! Apparently there IS such thing as bad publicity!